The transformation of psychoanalysis into an essential component of the social order does not justify the renunciation of every analysis of the unconscious; no more than the deadends of revolutionary movements imply the generalized desertion of politics. Finishing with the tyranny of the cogito, accepting that material, biological, social assemblages are capable of “engineering” (machiner) their own kind and creating heterogenous complex universes: such are the conditions which would make it possible to understand how the most intimate desire can communicate with the social field. In order to give the reader a little bit more of a taste, I have excerpted from pages 180-182. No logical or topological category, no axiomatic can subsume all the different types of machinic consistency. Because abstract machines are non-decomposable on an intensional plane, they cannot be inserted into an extensional class. Since no abstract machine can rise above history or be the “subject” of history and machinic multiplicities traverse the strata of different “provisionally dominant” realities on a diachronic and synchronic plane at the same time, it cannot be said of the general movement of their line of deterritorialization that it demonstrates a universal and homogenous tendency, for it is interrupted at every level by reterritorializations upon which microcosmic generations of deterritorialization are grafted once again. The cartography of abstract machinisms makes history by dismantling dominant realities and significations: they constitute the navel, the point of emergence and creationism of the machinic phylum. Here again we find the problematic of the alternative between subject-groups/subjugated groups which can never be taken as an absolute opposition. The relations of alienation between fields of competence always suppose a certain margin which pragmatics has to locate and exploit: in other words, within any situation whatsoever, a diagrammatic politics can always be “calculated,” which refuses any idea of fatalism, whichever name it may take on: divine, historical, economic, structural, hereditary, or syntagmatic, a politics which thus implies, in the first place, an active refusal of any conception of the unconscious as a genetic stage or structural destiny. A group requires an ongoing localization of the investments of desire capable of thwarting bureaucratic reifications, leaderships, etc. “Working on” the group’s map would consist in proceeding to the new uses and transformations of the group’s body without organs. One could only do his or her part in such a pragmatics: it can do nothing but challenge every status of the hegemony of linguistics, psychoanalysis, social psychology, and the entirety of the human, social, juridical, economic sciences, etc…Studying the unconscious, for example in the case of Little Hans, would consist in establishing, by taking account of the entirety of his semiotic productions, in which tree or rhizome type his libido has come to invest. At such a moment, it is a question of how the neighbors’ branch is trimmed, following which maneuvers the Oedipal tree is reduced, what roles Professor Freud’s branch and his activity of detteritorialization have played, why the libido has been constrained to find shelter in the semiotization of a becoming horse, etc…Thus phobia would no longer be considered as a psychopathological result, but as the libidinal pragmatics of a child who has not been able to find other micropolitical solutions so as to escape from the familialist and psychoanalytic transformations. Thanks of the extended quotation, much appreciated.I have not read this text. 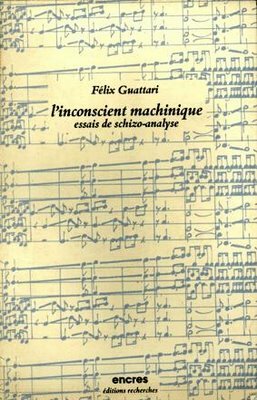 I might recommend to others, or even you if you have not read it, Gary Genosko’s Felix Guattari: An Aberrant Introduction, which works hard to bring to light the theoretical brilliance of the always second mentioned G of the D.Chapter 5 on the Four Functors, the four ontologies, is so marvelous I thought today I would love to organize a novel around them.